Does anyone know the name of the office building next to the new Metronet building on Blackfriars Road (opposite Southwark Stn and The Ring pub). It just seems very sneaky of them to late last night erect one wind turbine undercover of darkness on the top of the building and then this morning at 7.30am I noticed a second turbine had also been positioned alongside! Whilst I have nothing against the turbines it does seem very sneaky of them to erect them undercover of darkness! I, and many others are already extremely concerned with all the "re-generation" of SE1 as it's having a major impact on our neighbourhood communites - all for the sake of big business! 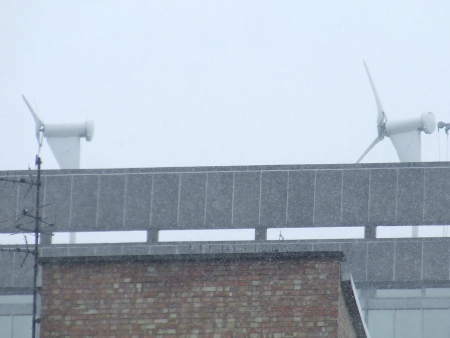 The turbines are on the roof of Colombo House, the BT telephone exchange above Blackfriars Road Post Office. They do have planning permission - the application was heard by Borough & Bankside Community Council. Details here: 07/AP/2906. We gave the BT turbines a brief mention in this news item about the Palestra wind turbines (which have still not been reinstated). They are noisy! Not unbearable, but they can definitely be heard 100 metres away and through windows. I thought at first it was a helicopter, but having noticed them over the last few days, I realised its the turbines -they definitely do make a loud whirring noise. I have certainly noticed the noise of the turbines a lot on these recent breezy summer evenings. Any further news on the mysterious disappearance of those on the Palestra building? I find the noise from the bars on Isabella Street much worse. Sometimes there are hundreds of people in the street drinking, it's unbearable some nights. I don't mind the wind turbines, they are barely noticable next to the noise of the trains and cars during the day. I'd love it to be quiet enough at night to hear them! I would also like to know where the turbines on Palestra have gone, it was the only redeeming feature of the building. Can you find out James? They're back, well at least two of them are. The turbines that disappeared off of the Palestra building roof some time ago are back. They are both spinning like crazy this morning. Those pigeons had better watch out again. There's still a load of stuff up there, so maybe there are still more to be fitted.